The NCC has released a discussion document on OTT apps. The discussion document is supportive of net neutrality, meaning that operators are not allowed to discriminate between data packets. The report concludes that before any regulation of OTT apps can be considered, the impact of OTTs on traditional revenues streams needs to be analysed. 1) As part of SIM registration procedures implemented by the Nigerian Communications Commission (NCC), registration of new subscribers must take place in a “permanent building with logos and structures” (source), adding to the cost of subscriber acquisition. 2) On 10 June 2016, as a result of not complying with SIM registration procedures, MTN agreed to pay 330 billion Naira (USD 1.67 billion) over three years in full and final settlement, in addition to complying with certain other regulatory conditions (MTN Interim Results, Aug 2016). 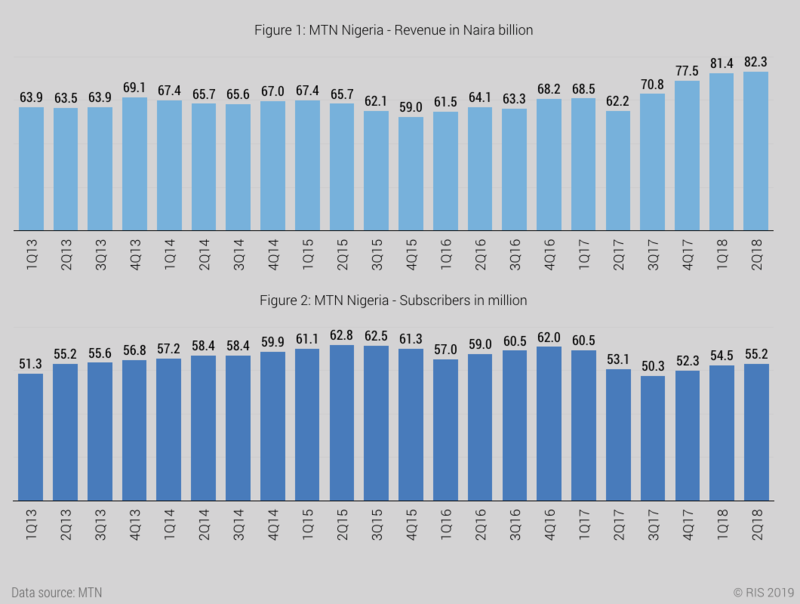 3) MTN lost 8.8 million subscribers between Dec 2016 and June 2017 (Figure 2). The massive reduction in subscriber numbers in the second half of 2016 is due to the SIM registration requirements imposed on MTN by the NCC. 4) The NCC has implemented price floors for data in 2015, withdrawn the regulations in the 4th quarter of 2015, then issued similar price floor regulations in November 2016, only to withdraw them in December 2016 (source). The net effect is an uncertain regulatory environment and this explains why MTN Ghana (see the Ghana country page) has transitioned more quickly to a data-centric business model compared to MTN Nigeria (Figure 3)..
Nigeria has four mobile operators: MTN (36% market share), Airtel (25% market share), Globacom (26% market share) and 9mobile (12% market share). Of these, Airtel and MTN are public companies. For MTN, the decline in Rand-denominated revenues is partly due to exchange rate fluctuations. In Naira, total revenues increased between 2013 and 2016 (Figure 1). In 2017, revenues declined in both Rand terms and also local currency because of the loss of 8.8 million subscribers and sharp decline in the value of Naira due, in part, to low oil prices. Since Q3 2017, revenue expressed in Naira started to grow again and reached record levels in Q2 2018. 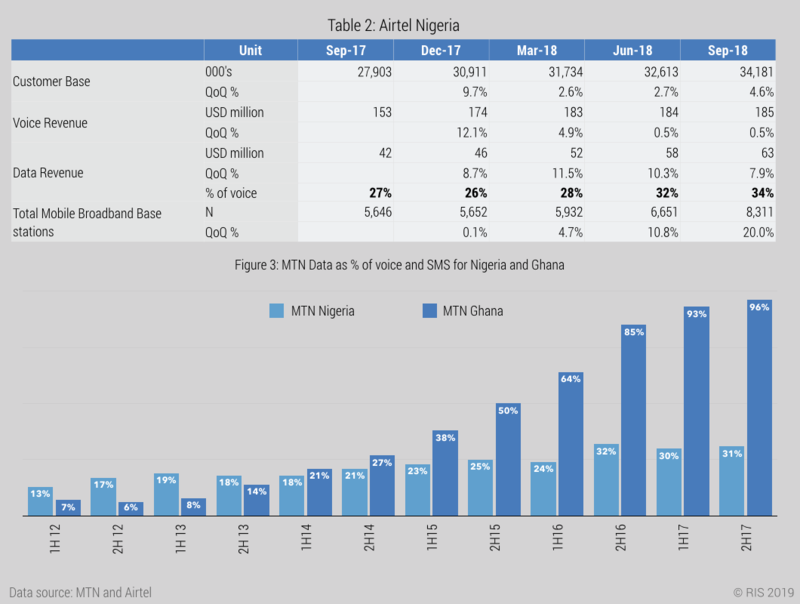 For MTN, Ghana and Nigeria represent quite divergent scenarios: In the second half of 2013, data as a percentage of voice and SMS was higher for MTN Nigeria than MTN Ghana. 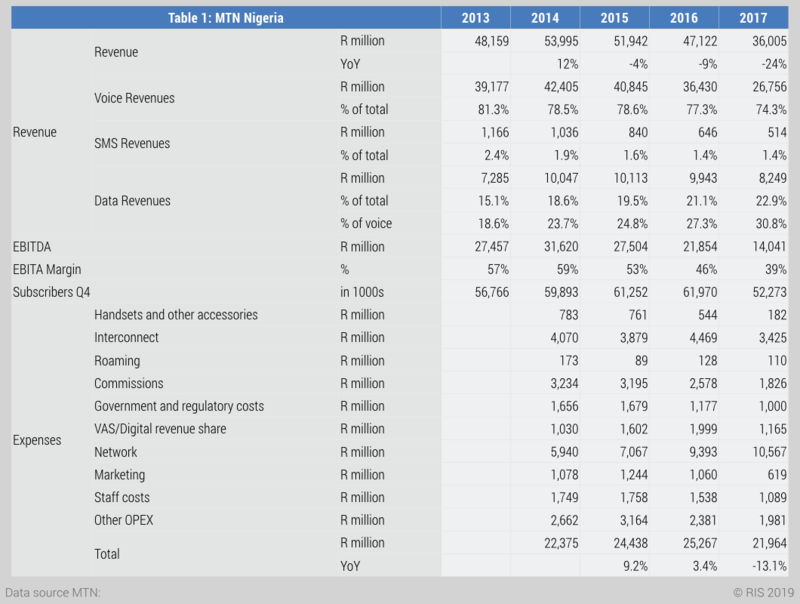 In 2018, data represents 32% of voice and SMS revenues for MTN Nigeria. In comparison, in Ghana, data as a percentage of voice and SMS is 85%. There is significant data growth potential in Nigeria. Data for Airtel Nigeria is only available for the last two quarters of 2017 and the first three quarters of 2018, which is five quarters in total. During this period, Airtel’s subscriber base grew consistently. Data revenues grew by two digit figures while growth in voice revenues has levelled off. Between Q2 2018 and Q3 2018, Airtel’s revenues have continued to grow. MTN’s revenues increased between 2013 and 2016. In 2017, revenues declined due to the disconnection of 8.8 million subscribers as part of a SIM registration requirement. Data prices have been the subject of several price floor regulations (subsequently withdrawn) but regulatory interventions have had a significant, and negative, impact on the market. MTN Ghana shows that Nigeria has significant upside potential in terms of data growth.